Pre-heat oven to 325°F / 162°C, using centre rack. Fill kettle with water and simmer for later. Fold dish towels and place on bottom of baking dishes (to prevent slippage), place ramequins on top of towels. Pour heavy cream into a sauce pan. Split and scrape vanilla bean, and add to cream (including shell and pods). Add nutmeg and ginger to cream. Scald cream on medium heat. A skim will form, that’s normal. Pour cream through strainer into a medium-size bowl. Stir pumpkin into hot cream, let stand 5 minutes. Meanwhile, in a new bowl, mix sugar and salt. Use a ladle to temper the hot cream into the egg mixture; adding one third at a time, stirring it in. Place a small strainer over a ramequin. Use ladle to reach the bottom of the bowl where all the vanilla bean pods have sunk, and ladle some mixture through the strainer. Do this for each one to ensure every portion gets a generous amount of vanilla pods. Place both pans in the oven and create a bain marie using the hot water from the kettle. Bake 35 minutes until the edges of the custard are set. Test for doneness by shaking, the centre should wobble like Jell-o. If the whole surface shakes give it 3-5 more minutes. If nothing shakes it’s overdone. Remove from oven and use flat spatula to lift ramequins out of the dish, and place on wire rack to cool for one hour. Cover each cup with plastic wrap and refrigerate overnight. Set ramequin on counter for 20 mintes to stand. Then remove plastic, and gently blot the surface with paper towel to remove condensation. Sprinkle one teaspoon of turbinado sugar onto each custard. Cover the edges first and work towards the centre, then tilt and tap the ramequin to spread sugar evenly. 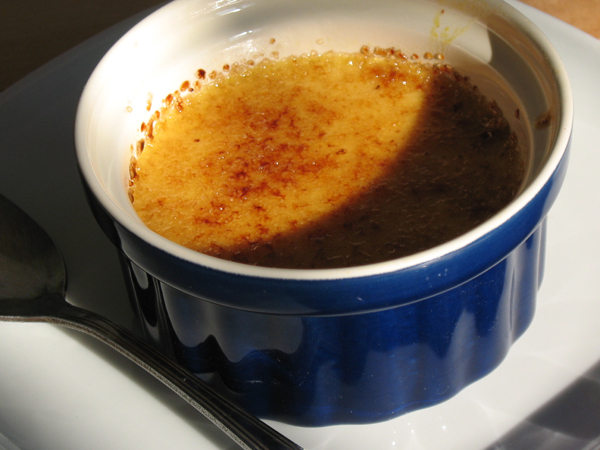 Place ramequin on fire-proof surface and carmelize sugar with blowtorch. Chill for 10 minutes then eat.